A tripartite meeting of foreign ministers and intelligence chiefs from Egypt, Jordan, and Iraq is expected to convene in Cairo on Saturday, a statement by Egypt’s foreign ministry read. Foreign Minister Sameh Shoukry and the head of the General Intelligence Service Abbas Kamel will represent Egypt at the meeting, MENA reported. 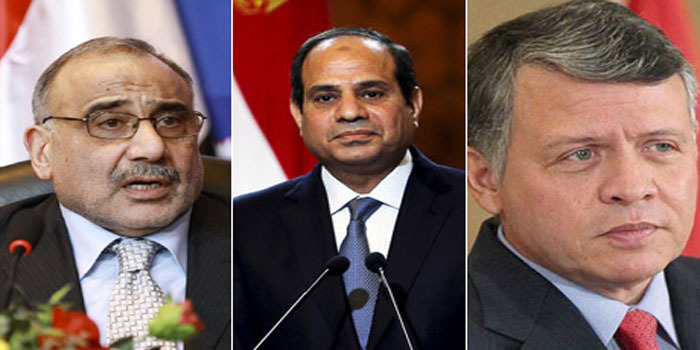 President Abdel-Fattah El-Sisi, Iraqi Prime Minister Adel Abdul Mahdi and King Abdullah of Jordan will also hold a tripartite meeting in Cairo on Sunday. El-Sisi announced the tripartite meeting at a bilateral press conference with Abdul Mahdi on Saturday.